Online Degrees | Blog | What Can You Do with a Health Administration Degree? Health administrators play a central role in the health care industry; they are the link between people who care for patients and those who provide the record-keeping, accounting, and other management support services. 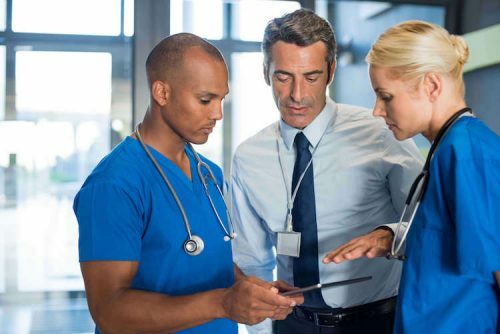 As health care providers expand their services and diversify into new medical specialties, the need increases for administrators who possess top management skills combined with a solid understanding of the challenges facing the health care industry. Graduates can now do more with a health administration degree than ever before. A wider range of career options becomes available as specialty medical services proliferate and public health receives greater attention. Exciting new employment opportunities are available to health administrators in such traditional areas as health care facilities and public health departments, and increasingly in other industries, such as manufacturing, insurance, technology, and management services. Leadership and management skills are in great demand to address the tremendous changes that face the health care industry — new health regulations, economic models for health services, technologies, and health care delivery methods. One way to gain the knowledge and expertise required to overcome these and other challenges is by earning a Master of Health Administration (MHA) degree from Regis College’s online MHA program. The curriculum of the Regis MHA degree program emphasizes the leadership and management competencies most in demand by employers in health care. The skills are also in demand for health-related positions that employers in other industries seek to fill. Classes are taught by practicing health care professionals who impart their insider’s experience and perspective to students. In addition to addressing the political and policy matters impacting health care, the MHA program is grounded in a commitment to improving access to first-rate health services for all members of the community. Among the classes offered in the Regis MHA program are Health Information Systems, Health Care Quality Management, Economics of Health Care, Public Relations/Marketing Communications, Research Methods for Health Professionals, and Financial Analysis in Health Administration. Students develop vital skills such as critical thinking, strategic planning, technical literacy, finance and accounting literacy, and professional and interpersonal communication. The goal of the Regis MHA program is to expand what you can do with a health administration degree by presenting health care administration from a range of perspectives: business, government policy, and the patient’s point of view. MHA coursework expounds on the ethical, regulatory, financial, and technological forces shaping the health care industry to heighten not only the effectiveness of management and public relations for care providers, but also public health awareness for entire communities. While hospitals, clinics, long-term care facilities, and other traditional health care services remain the primary employers of health administrators, new career opportunities are available in insurance companies, nonprofit organizations, government agencies, and other industries. The roles of health care providers continue to expand as health matters impact more aspects of the lives of community members. For example, tech companies involved in telemedicine services look to health administrators to guide their activities related to patient interaction as well as to help train doctors, nurses, and other health care professionals in the most effective use of remote-care and other medical technology. As the U.S. population ages, more attention is placed on the need for effective and affordable long-term care. In most instances, long-term care is nonmedical and simply assists people with day-to-day activities, such as hygiene, meals, transportation, communication, and housekeeping. However, older people and others with chronic health problems increasingly require long-term medical care, usually in a health care facility. The U.S. Department of Health and Human Services (HHS) estimates that 35 percent of the U.S. population will require long-term care in a nursing facility, with an average stay of one year. Another 13 percent will need assisted-living services lasting less than one year, and 37 percent will have to spend an average of one year in some type of long-term health care facility. These institutions remain a principal employer of health administrators, but the positions continue to gain many new responsibilities and a wider range of roles as medical technology advances and means of providing hospital-based health services evolve. Among the duties of hospital health administrators are hiring staff, coordinating business and support functions, and establishing policies for employees, procedures, and patient services. Health administrators working in hospitals may be responsible for managing patient records, ensuring that the staff meets continuing education requirements, and contributing to the facility’s long-term growth and development plans. A growing number of health administrators work in this field, where the fast pace of regulatory and technological change has created a great deal of uncertainty. Insurance companies seek health administrators who are able to offer insight from many different perspectives about the current and future state of the health care industry. Particular areas of interest include finding new funding sources, applying innovative health management techniques, and devising creative approaches to address the need to maximize the value of investments in health care. To fulfill these duties, health administrators employed by the insurance industry must have critical thinking and problem-solving skills, as well as a thorough understanding of health regulations, management, and health care technology. Many health administrators find rewarding careers working for nonprofit organizations. The Nonprofit Quarterly notes that the way nonprofit hospitals are governed is evolving rapidly as more transparency and accountability result from enforcement of the provisions of the Affordable Care Act (ACA). In particular, the ACA requires that nonprofit hospitals document their charity care activities, debt-collection practices, and community health assessments. The ACA also calls for nonprofit hospitals to devise and implement plans based on these three areas. The range of what you can do with a health administration degree continues to grow as more products and services have a health care component. For example, makers of health-tracking devices and wellness software tap the expertise of health administrators to ensure their applications comply with government regulations relating to the collection and storage of consumers’ sensitive medical information. Similarly, industries outside of core health services, such as consumer electronics and retail chains, are enhancing their products and services with health-related components that introduce new regulatory and other potential liabilities. Few health administrators graduate with a goal of working for a manufacturing company, yet medical equipment manufacturers have a growing need for managers who understand the health care industry from diverse perspectives to ensure that their products are designed to meet the needs of patients and caregivers. As physician groups proliferate, they look to health administrators for the skills necessary to keep their operations running smoothly, ensure compliance with privacy rules, and prepare them for the inevitable changes that will impact future health environments. The work responsibilities of professionals who work in this field vary across jobs, often depending on the specific nature of the business. However, graduate-level health administrators can can also apply the management, communication, and leadership skills they develop from completing the curriculum of the Regis MHA program into non-healthcare related occupations. For example, a manufacturer developing a health-tracking product intended for the elderly needs to design the interface with the physical limitations of the target market in mind. A health administrator can inform the developers of approaches that address these and other health-related design aspects. People are drawn to the field of health administration by the opportunity to have a positive impact on the health and well-being of their communities. They are also attracted by the dynamic nature of health care, which continues to be transformed by technology, regulatory change, and the ever-evolving needs of consumers. Health administrators with the appropriate education and skills are poised to lead the industry’s transformation well into the future. The obstacles facing the health care industry are formidable, the challenges sometimes daunting, but those with the drive and the right preparation will help shape its future and contribute directly to the well-being of their communities.